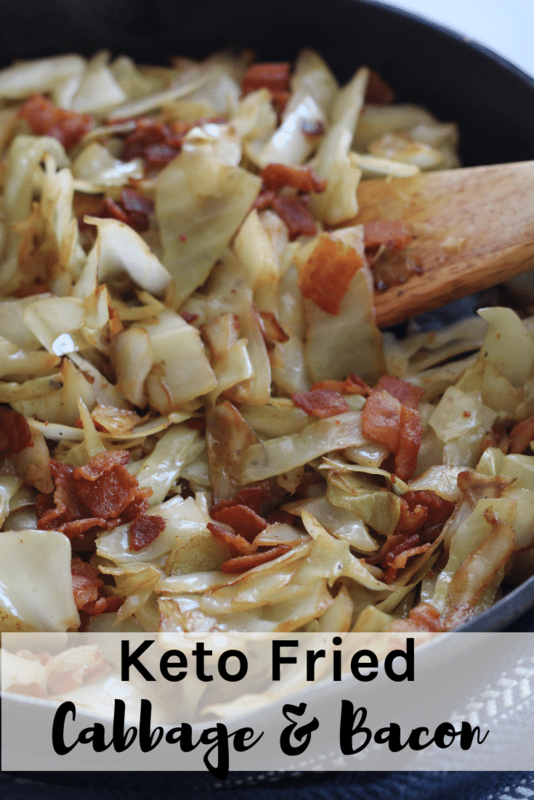 This Keto Fried Cabbage with Bacon is the perfect side dish or can stand alone as a meal. It’s versatile in flavor and perfect for a low-carb diet! I don’t know why cabbage tends to get such a bad rap. In our house, we love eating it because it really can go with a variety of different meals and flavors. Plus, cabbage does a great job at picking up seasonings and sauces so it becomes super flavorful really quickly. 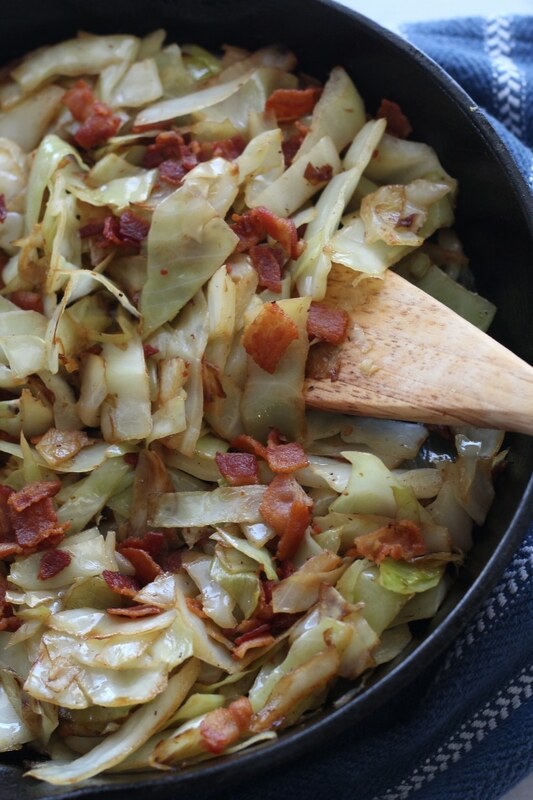 While cabbage is great on its own, the fact that this recipe adds bacon takes it over the top. (C’mon…who doesn’t love bacon?) The bacon adds that saltiness that pairs perfectly with the cabbage and once fried together…it’s a real treat for your taste buds. Cutting the cabbage to cook evenly is important. First, rinse and remove the loose leaves. I typically remove several layers then I rinse again. Next, place the stem end flat on a cutting board and cut the cabbage in half. Once done, cut it in half again, and again to help make the cutting and chopping a bit easier. Proceed in removing the white core. Take each quarter of the cabbage and slice into thin strips. Then, go back and cut the strips into smaller pieces until you have chopped the entire cabbage. If you happen to have any leftovers, it’s important to store this low carb cabbage with bacon properly so that it’s good to eat the next day. If you are keeping in the fridge, store in a shallow airtight container for 3-4 days. For freezing storing, store in a covered airtight container or freezer bag for up to 6 months. Once ready to eat, thaw in the refrigerator for best results. Are you looking for other low-carb side dishes? 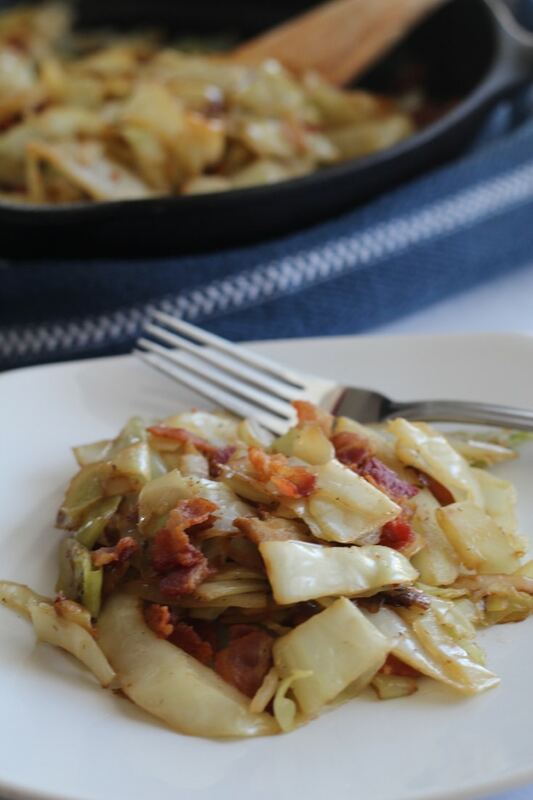 What are some main dishes that will pair well with this Keto Fried Cabbage with Bacon recipe? With cabbage being so versatile, the sky is the limit on what you can pair up with this delicious dish. I recommend a simple Keto Pot Roast or Parmesan Crusted Keto Pork Chops. If you want to keep the meal a bit more casual, this fried cabbage would taste amazing with a delicious Butter Burger. 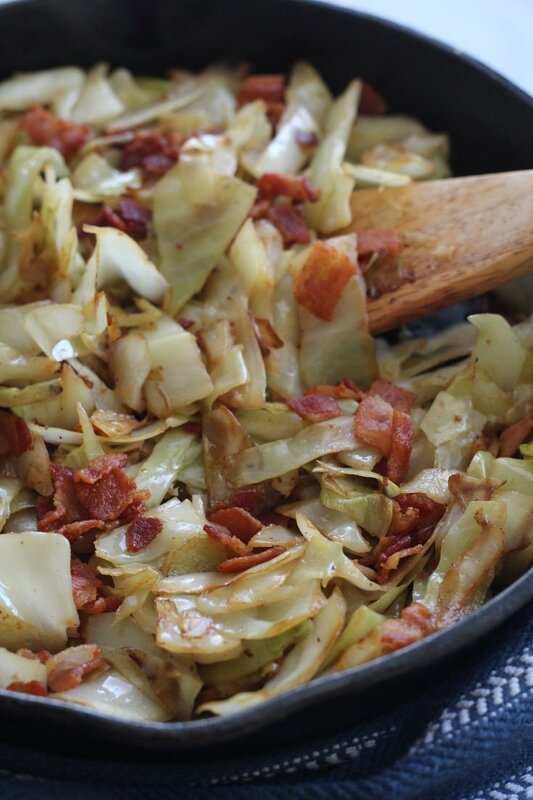 This Keto Fried Cabbage with Bacon is the perfect side dish or can stand alone as a meal. It's versatile in flavor and perfect for a low-carb diet! Place your bacon in a skillet and fry until cooked. Remove bacon from pan and set aside, leaving 3 tablespoons bacon grease in the pan. Take your onion and saute in the bacon grease. Next, add the cabbage, chicken broth, garlic powder, salt, and pepper to skillet and bring it to a boil. Once boiling, cover with a lid and reduce heat to medium-low. Simmer cabbage for 20 minutes or until it reaches desired tenderness. Once done, remove from pan. Crumble the cooked slices of bacon on top and serve. Don’t forget to check out all my recipes in my Keto Recipe Index. Here are some other great ket0-friendly recipes you might enjoy! « *IT’S BACK! * Instant Pot 6-in-1 Programmable Pressure Cooker – Black Friday PRICE DROP! 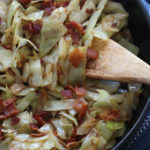 Where can I find the nutrition information for the Fried Cabbage with Bacon recipe? I track all my food every day and I would really like to try this. Love your recipes! That information has been added to the post. It is at the very bottom of the recipe card. Thanks! Add 1# of bulk pork sausage and it’s a meal in itself! I have never needed extra liquid. Been making this for a while now. You can also make it tex-mex by adding smoked paprika and cumin or some chili powder.